The Economic and Financial Crimes Commission, EFCC, has accused a cousin of the former Gombe State Governor, Danjuma Goje, for allegedly paying over N1.4billion in six years to supply food to the state government house. The anti-graft agency told a Federal High Court in Jos on Monday. A prosecution witness, Saliu Sambo, a Director of Administration and Finance in the state, gave evidence on details of food supply from 2003 to 2011 during Goje’s administration. 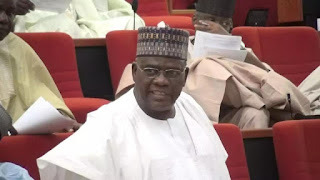 Goje is being prosecuted by the Economic and Financial Crimes Commission (EFCC) on charges bordering on conspiracy and money laundering. Sambo said the food contractor was the former governor’s cousin, adding that N1,451,682,518.6 was paid to the contractor between 2003 and 2011. Another witness, Mohammed Balbaya, a cashier at the Government House, confirmed that the food contractor was paid N1,451,682,518.6 between 2003 and 2011. Another witness, an Assistant Director of Finance and Account, Universal Basic Education Commission (UBEC), tendered a certified true copy of Federal Government’s Approved Guidelines for Accessing and Utilisation of the UBE Intervention Fund, issued in March 2006. He also tendered a copy of Federal Ministry of Education Circular of September 9, 2008 and signed by Goke Adegboroye, entitled: Re: Review of the disbursement formula of the Federal Government’s two per cent of Consolidated Revenue Fund as Intervention to the UBE Programme. Adegboroye said the supply of dictionaries, allegedly done under the Goje administration, was not covered by the guidelines.